Teachers are likely to come across the terms accommodations and modifications if they have students with special needs in their classrooms. These terms are commonly found in Individualized Education Plans (IEPs) or 504 plans and refer to adjustments to the curriculum and environment that can make learning accessible for students with disabilities. These changes help students participate more actively in classrooms. Teachers, as part of the IEP team, must have a clear understanding of these terms. Accommodations refer to changes to the educational program, procedures and materials, without substantially altering standards (instructions), criteria, expectations (assessment) and content (curriculum and materials). Implementation of these changes can help students to overcome specific challenges or barriers that hinder learning. One key point is that accommodations do not change the expectations placed on students. With accommodations, students are expected to acquire the same skills and learning as other students. Therefore, teachers can use the same grading system to grade the performance of students with disabilities. Presentation Accommodations: This refers to changes than can help increase students’ access to information for the purpose of instruction and assessment. A student with visual impairment can be given Braille textbooks, textbooks which have larger print size and font or audio-texts. Hands-on learning, use of visual cues, organizational tools and manipulatives are some ways by which teachers can make the presentation of instructions more accessible for students. Response Accommodations: Implementation of response alterations can enable students to demonstrate their understanding of content or learning with ease. 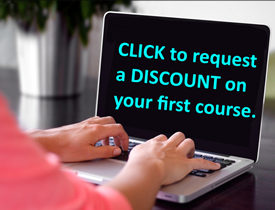 A student with difficulty with fine motor skills can submit a typed assignment instead of a written assignment. Use of scribes, oral assessments and use of assistive devices are some ways of helping students to express their learning. Setting Accommodations: When changes are made to the classroom environment, they are known as setting accommodations. A student with hearing impairment can be allowed to sit directly in front of the teacher. Students with attention deficit disorder may sit far away from aisles, windows and doors to reduce distractions. Teachers can create quiet spaces equipped with sensory items to help calm students with sensory sensitivities. Schedule Accommodations: Timing and schedules can be altered to allow for all students to complete their work and transition to new activities. A student who is slower at processing information can be allowed extra time for writing tests. Students with autism can be given frequent breaks between activities. Modifications are alterations made to academic programs, procedures and/or assessments and can alter the standards, criteria, expectations, levels and content. These are suggested when students are unable to perform in accordance with the educational standards due to their disabilities. Unlike accommodations, modifications do change the expectations placed on students. These learning goals and objectives are framed to account for individual students’ strengths and areas of weakness. When modifications are required, students are not expected to attain the same skills or learn the same content as prescribed by the general standards of education. A student with a cognitive impairment may be required to complete only some assessments. Students may be expected to complete only part of the curriculum. It is important to emphasize that equal access to education should be made possible for all students. 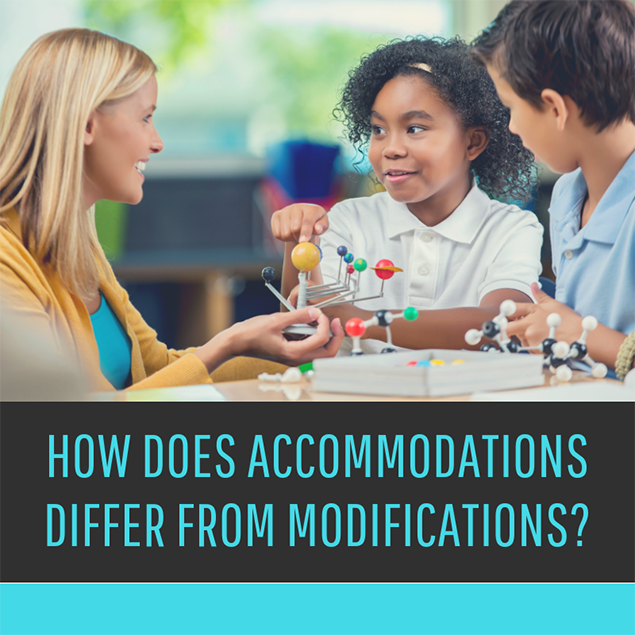 It is crucial for teachers to understand the differences between accommodations and modifications to help students with disabilities participate and explore learning to their maximum potential.